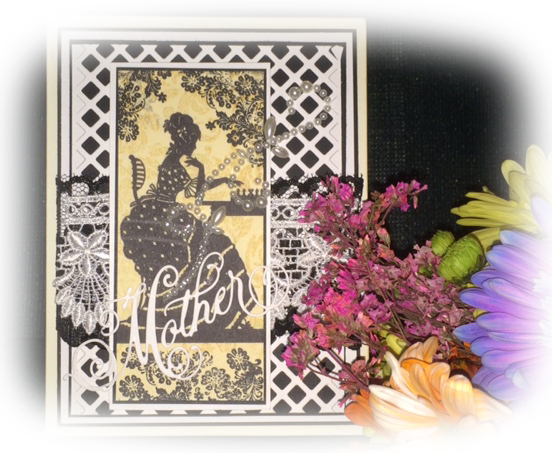 Before the day is come and gone, I thought I had better get the card that I made for Mother’s Day on my blog! This design is based on the design by Becca Feeken at her site amazingpapergrace.com I love the simplicity of the black and white with just a touch of beige. The swirl of pearls was the icing on this cake! My card is slightly different because I do not have all the same dies that Becca has and I had to create my focal piece from free images on line, inks and stamps from my stash. The original card I saw on Becca’s site was described as a purchased digital image but I could not locate it. At my husband’s suggestion I looked at free images and found the exact lady which I printed out and then manipulated with the tools I had at hand. I hope you enjoy this card… And, I’d love to hear from you! Blessings and Hugs, ya’ll ! 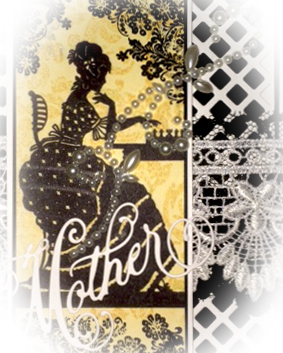 This entry was posted in card, Holiday, paper craft and tagged beads, beige, black and white, flowers, lace, lady, mothers day, victorian. Bookmark the permalink.